Based on the basic ingredients, the cheese can be made from cow's milk, buffalo, sheep and goats. While the texture of cheese is classified into two types, namely young cheese / soft (soft cheese) with moisture content 36-40% and an old cheese / hard (hard cheese) water levels of 25-36%. Soft cheeses from France was first made in the 18th century in the village of Normandy. Comembert made from cow's milk, its texture is very soft with a creamy yellow color. This cheese contains fat between 45% - 50%. In addition to delicious digado or as a table cheese, also suitable for mixed omelette, souffle content, pancakes or apple pie. Ricotta cheese comes from Italy. Soft cheese from cow's milk is very brittle texture. Fat content is high, reaching 65%. combination of savory flavors and delicious with fragrant scent make feels right combined with a variety of Italian pasta dishes such as Lasagna and Spaghetti. Brie soft cheese category of Preancis. Characteristic of this cheese is a white outer shell and soft inner melt. Sharp aroma and high fat content (45%). Brie is very suitable for use as an ingredient mixed salad, eaten with olive fruit or pickle. In the market we can find two kinds of cream cheese, double cream cheese is the first choice with 65% fat content and cream cheese (45% fat) other options. Unlike other types of cheese, cream cheese has a slightly sour taste. This cheese is generally used in desserts, for example chesse cake, as the content of pies, or eaten with pieces of fruit. Italian cheese Mozzarella is originally from buffalo milk. Soft cheese with fat content between 40-50% of this highly-Specific nature. Mozzarella will melt when baked, is perfect for pizza toppings or mix fritata. One of the popular Dutch cheese. Hard texture with a flavor similar to peanut. Fat content of cheese is about 40%. What distinguishes the other cheeses are wrapped in layers of packaging which is always a kind of red wax. Edam is perfect for dry cake mix as a variety of cookies or sprinkling on grilled dishes. One type of hard cheese from the town of Parma, Italy. In general shape of a cylinder with a light yellow color. Hard texture, perfect for grated cheese. The aroma is sharp Parmesan for a long ripening process, between 14 months to 4 years. This cheese is perfect for topping pizza, soup and processed a variety of pasta. Cheese fat content of about 61%. One type of cheese from the UK's most widely consumed throughout the world. It was delicious with the scent is not too sharp cheddar made suitable for any cuisine. Dish casseroles, soup, sandwiches and salads feels more delicious with the addition of this cheese. Containing 48% fat Cheddar with ripening period 9-24 months. The origin of this cheese comes from Switzerland, one of the hard cheese that is quite popular. Emmenthal have different characteristics with other cheeses, the shape is unique because if the cut will be seen the holes formed during the fermentation process. 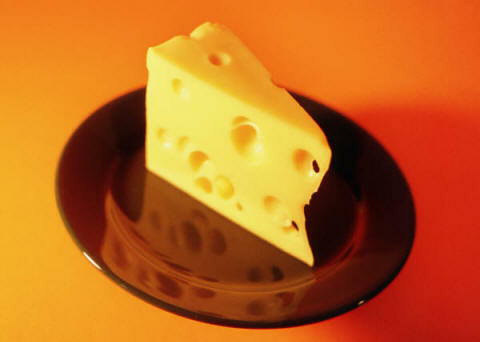 Cheese is much preferred because of its taste soft and rich aroma. From some research eating cheese can reduce the symptoms of pre-menstrual syndrome and strengthen bones. The content of various minerals are high on the cheese very well to protect teeth from caries, is because the element was to strengthen the tooth mineralization email.